Although many artists and non-artists alike engage with the process of collaging, a successful collage is not that easy to achieve. For the merger of unrelated images and/or texts to resonate beyond the obvious, there is much to take into consideration— point of view, message, cohesion of elements, formal arrangement, etc. Juxtaposing disparate elements from various sources does not necessarily construe art. 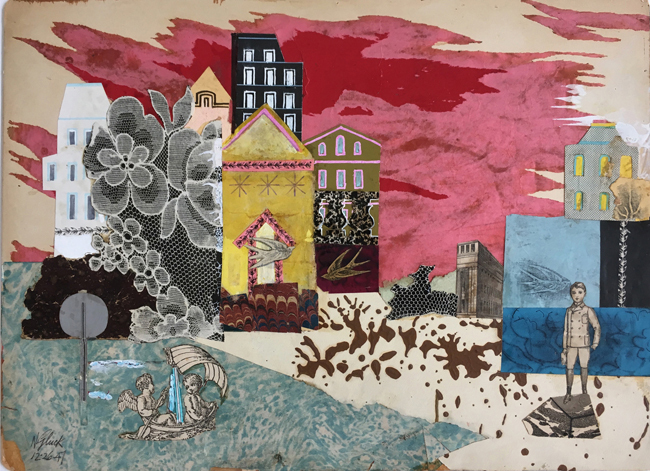 Collage has a broad history and those who venture into collaging must take into consideration their historical precedents. Popular and influential early collage artists include Max Ernst, Joseph Cornell, Hannah Hoch, John Heartfield and Kurt Schwitters — whose materials ranged from text and photographs to historical reproductions. Many artists have used collage to communicate their social and political views via the mass media. With the proliferation of digital technologies, collaging has become more commonplace as cutting and pasting is now easily achieved with software. Though not necessarily a household name, artist and former Andy Warhol studio assistant, Nathan Gluck (1918-2008) was a dedicated collagist. 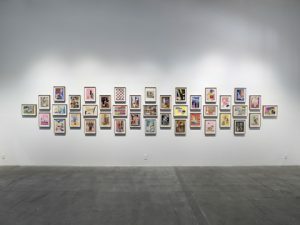 For over 70 years, he created works on paper that combined original and found materials that spanned numerous genres of collage from Dada and Surrealism to Postmodernism. On view at Luis De Jesus are approximately 80 collages created between 1930 and 2008 representing Gluck’s different approaches to the medium. These small works are installed chronologically and exhibited on the walls both individually, as well as in clusters, to allow viewers to compare and contrast the myriad styles and create their own narrative flows between the enigmatic and often mystifying works. Gluck’s early collages have an affinity to the works of Ernst, as both artists used black-and-white engravings as source material. Looking at the array of Gluck’s works, it immediately becomes evident that he has a keen and ironic wit and exacting sense of composition. 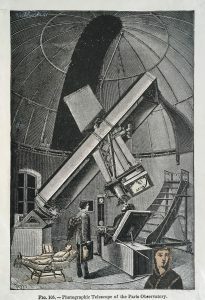 In his In the Paris Observatory, from 1941, for example, the artist montages a winged figure and female faces into an etching of a telescope in the Paris Observatory, perhaps suggesting female angels roam the sky. In Unlocking the Mind (1942), Gluck juxtaposes a black-and-white reproduction of a male head with his veins exposed from a scientific diagram placing a lock and key above his ear where the brain is located. The bright colored background alludes to an interior space where an old-fashioned machine is situated. 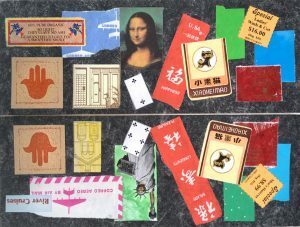 A white shape in the upper half of the collage displays the first nine letters of the alphabet culled from different sources and presented as one might write a ransom note. Another amusing early work is The Introduction (1943). Here, Gluck places two diagrams of machines into a de Chirico-esque landscape, anthropomorphizing them with outstretched arms ready to shake hands. While many of Gluck’s early collages draw from historical sources, the later works include more hand drawings, watercolors, contemporary souvenirs, personal mementos and pages from contemporary magazines. 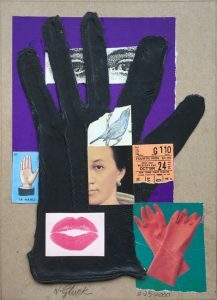 Glove at First Sight, 2-25-2000, is a tongue-in-cheek collage on gray cardboard, in which Gluck has combined a ‘real’ black leather glove with a color photograph of pink rubber gloves against a green background, the ‘La Mano’ Tarot card and a lipstick kiss. 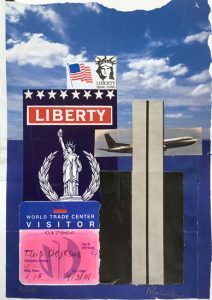 The sombre WTC, 9-12-2001, is a tribute to 9/11 in which Gluck layers reproductions of the Statue of Liberty and a visitor’s badge to the World Trade Center with a plane and geometric depiction of the towers as parallel rectangles. One of the final works in the installation is a gouache painting of a man by the sea whose arm is covered with food labels and other oval- shaped stickers suggesting tattoos. Gluck’s collages exhibit a wide range of styles and attitudes toward art and life. 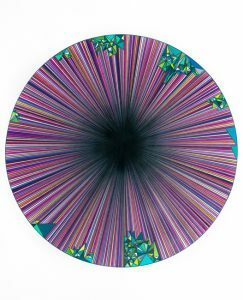 While the earlier pieces are more calculated and precise, the later works are more brightly colored and have an aura of fun. There is an interesting relationship between Gluck’s collages and Dennis Koch’s LIFE Cutouts (2018) on display in the back gallery. 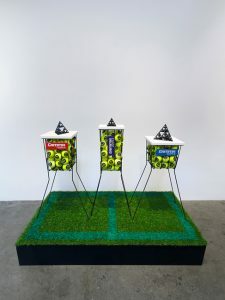 Koch makes drawings, sculptures and installations, and in this exhibition, Beyond the Funny Farm! 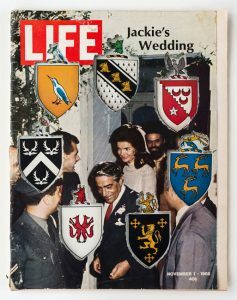 Crypto-K, Cutouts, Cut-ups, Copies, Mirrors, Membranes, and Temporal Algorithms, he presents two drawings, a sculpture and a wall of 100 copies of carefully excised LIFE Magazines. Where Gluck’s collages were an additive process from multiple sources, Koch digs through layers of the actual magazine to create his fascinating montages. 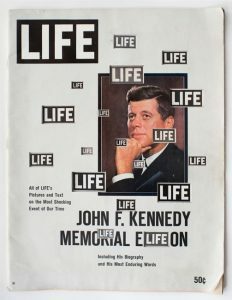 Koch begins by thinking about the cultural and political significance of the image featured on the magazine’s cover in relation to the supporting headline, as well as to the familiar red logo in the upper left corner of the page. From these, Koch extrapolates and invents seemingly random juxtapositions between images that appear later in the magazine, whose shapes have been carefully cut away to reveal these recessed images. 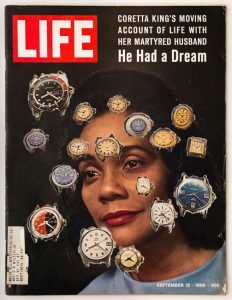 The image of Jackie is broken up by 17 images of gold and silver watches that come from advertisements within the magazine. In LIFE Cutout No. 019 (May 19, 1967, Wally Fruit Face), Koch disrupts the cover image of astronaut Wally Shirra, imposing a face over his face where a grapefruit and an orange become eyes, a mushroom becomes a nose and a piece of bacon is positioned as a mouth. When Koch’s intervention comments back on the cover image, these pieces resonate. LIFE Cutout No. 092 (January 31, 1969, Washington Monument Masks), for example, pictures a silhouette of the Washington Monument in conjunction with the caption, Rhetoric Meets Reality. This cover image is juxtaposed with creepy masks featuring the fragmented faces of white males. The implication is clear. 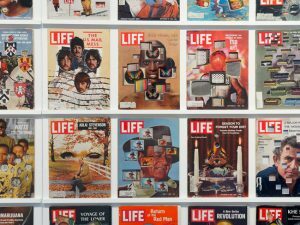 Koch is well aware of the impact LIFE Magazine had during its heyday as a purveyor of news and world events, and through this work, links journalism and advertising, past and present, to reveal what was subliminal and hidden within the magazines pages. Both Koch and Gluck transform a given, making something new from disparate sources in order to comment on the world.